Please note: While efforts have been made to verify the locations of religious centers and interfaith organizations maps may not always be accurate or up to date. For those centers without a physical address, a symbol appears at the city center. Read more about our methodology. Los Angeles is truly a cosmopolis—a world city. Its many ethnic and religious communities are so large that each one has a vibrant life of its own. Sprawling today over nearly five hundred square miles, Los Angeles got its start in 1771 as a small Spanish mission village. It was named El Pueblo de Nuestra Senora la Reina de Los Angeles, “The Town of our Lady, Queen of the Angels”: its early residents called it “El Pueblo.” In 1850, when California achieved statehood, this town was over 85 percent Spanish-speaking and Mexican. Even today, Latinos constitute the largest ethnic group in the city. Steady immigration from Mexico and Central America has made Los Angeles a thriving center of Latino cultures. Today, the area of Greater Los Angeles and Orange County is a vast composite of many “pueblos,” including Japantown, Koreatown, Watts, Little Saigon and Little India, all bound together by hundreds of miles of freeways. Its large African American population, both Christian and Muslim, is based in the economically beleaguered South Central area of Los Angeles. In the early 1900s, on Azusa Street, the first burst of new American Pentecostalism began with the multiracial Azusa Mission of William J. Seymour, an African American preacher. As the birthplace of Pentecostalism (now a worldwide phenomenon), Los Angeles is a fitting home for the Pentecostal and Charismatic Research Initiative, one of the many vibrant programs of the Center for Religion and Civic Culture at the University of Southern California. Moving north, one finds the amorphous Koreatown and, to the northeast, Japantown, both exemplifying the rich Asian American life of Los Angeles. In the 1850s, there were but a few recorded Chinese residents. Today, the Los Angeles suburb of Monterey Park is virtually half Chinese (and over two-thirds Asian), the first example in the U.S. of an urban Chinatown having grown and moved to the suburbs to become a Chinese suburb. South of the city in Orange County is Little Saigon, which stretches through Westminster, Santa Ana, and Garden Grove. Long Beach is home to the largest Cambodian population in the U.S., with Cambodian Town stretching down a one-mile corridor along Anaheim Street. These various ethnic “towns” do not contain, but rather anchor the cultures of a vast and diverse Asian American population spread throughout Los Angeles and Orange Counties. 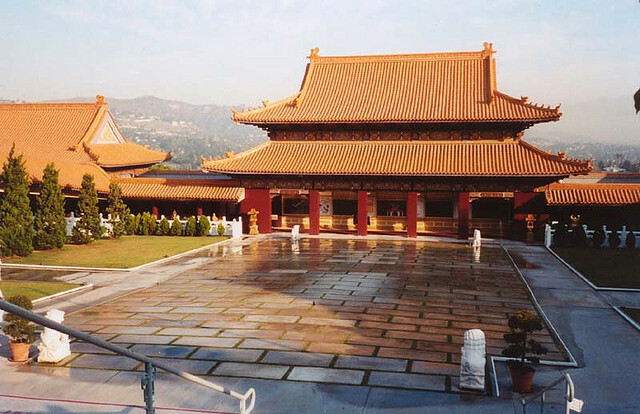 With such an extensive Asian heritage, it is hardly surprising that Los Angeles has now become the most complex Buddhist city in the entire world. 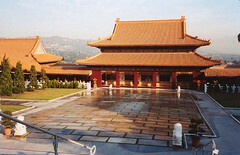 With well over 200 Buddhist temples and organizations in the area, one can see as many different faces of Buddhism on a weekend trip to L.A. as on a month-long visit to Asia. Beyond its large Latino and Asian populations, Los Angeles is sometimes called “Irangeles” because of the significant number of Iranians who have settled here. 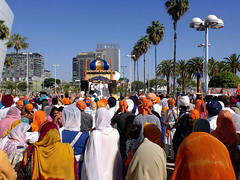 Iranians of L.A. may be Bahá’í, Jewish, Muslim, or Christian; in addition, many are Zoroastrian. 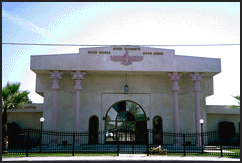 Together with Parsi Zoroastrians from India, they have established a Zoroastrian fire temple in Westminster, California, in the heart of Little Saigon. Los Angeles’ diverse and thriving Jewish community dates back to the mid-1800s. The first synagogue was established on Wilshire Boulevard in 1862. Congregation B’nai B’rith is now called the Wilshire Boulevard Temple, one of the largest Reform temples in the country. Today, more than half a million Jewish people make their home in L.A. They have established synagogues across the spectrum of Jewish practice, including a Synagogue for the Performing Arts. For those keeping kosher in L.A., kosher restaurants include Italian, Mexican, French, Chinese, Ethiopian, and Persian cuisine. There is much more to L.A.’s story today. Its Hindu heritage includes centers of the Vedanta Society and the Self-Realization Fellowship that have been present for well over half a century, temples of Krishna Consciousness, a multitude of small newer temples, and a large, spectacular South Indian-style temple near Malibu in Calabasas. 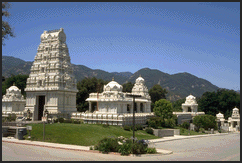 The Hindus of Los Angeles attend some ninety-three different Hindu temples and religious centers, according to estimates by the Association for Religion Data Archives. The Muslim population of L.A. has also grown significantly in the past three decades. There are over seventy mosques, Islamic centers, schools and institutions in the Los Angeles area. 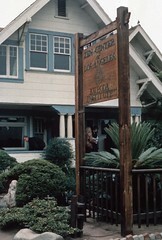 The Islamic Center of Southern California, for example, sponsors lectures and programs for visitors and new Muslims, and distributes pamphlets about Islam written in Spanish for Latino converts. The Center is home to the Academy of Islamic Thought and was instrumental in the 1996 founding of the Umma Clinic, the first Muslim hospital established in the United States. Throughout its history, the experience of Los Angeles has made manifest the promise—and the difficulties—of a pluralistic society. In 1871, nineteen Chinese people were killed in anti-Chinese riots, the worst riots of this sort on the West Coast. Later, the 1892 Geary Act, which required strict certificates of residence, forcibly removed Chinese families from their homes in certain areas of Los Angeles. Similar housing restrictions were brought against L.A. Jews, Japanese, and African-Americans in the following decades. More than a century later, riots erupted in April 1992 in response to a racially-charged court case that ended with the acquittal of police offers accused of brutally beating L.A. resident Rodney King. All of these instances display the difficulties and divisions of a multicultural and multiracial city; indeed, the problems of Los Angeles are those that increasingly beset the entire world. In Los Angeles, there has also been some genuine movement toward greater engagement with religious differences and the pursuit of pluralism. The Interreligious Council of Southern California is one of the nation’s oldest urban interfaith councils, with over forty years of experience building relationships between religious leaders of many faith communities. In the wake of the 1992 riots, the Council sponsored “Hands Across Los Angeles—All People One City.” As a witness to the cooperative energy of pluralism, over 15,000 people from 120 faith communities joined hands to form a ten mile human chain through the heart of the city. After the events of September 11, 2001, cooperative efforts have included NewGround, founded to “change the tone of the conversation” between the Jewish and Muslim communities in Los Angeles. Housed at the City of Los Angeles Human Relations Commission, NewGround seeks to replace “tension and mistrust” with “productive engagement.” These initiatives recognize that Los Angeles is today a microcosm of the world with its complex problems; such efforts also acknowledge it is a city with compelling possibilities.